The global market for optical brighteners is consolidated in nature. The main four players in the market, namely AkzoNobel N.V., Eastman Chemical Company, BASF SE, and Huntsman Corporation, held more than 54% share in the market in 2015. Among them, BASF SE led the market with about 22% share in the same year. As per a report by Transparency Market Research, the big names operating in the optical brighteners market are expending a lot of energy and money on making inroads into undeserved markets in emerging economies in Asia Pacific. BASF SE, for instance, unveiled a new research and development center in Navi Mumbai, India in March 2015, keeping in mind its improving global profile. Besides, the company already has a sprawling chemical production complex at Dahej in Gujarat, India. Other popular routes adopted by savvy entities in the global market for optical brighteners to gain greater foothold are mergers and acquisitions with specialty chemical manufacturers in developing regions, manufacture of organic products, and manufacture of quality intermediates. According to the TMR report, the global market for optical brighteners will rise at a 4.1% CAGR from 2015 to 2023 to become worth US$1.71 bn by 2023 from US$1.12 bn in 2014 to. Vis-à-vis volume, the market will rise at 3.8% CAGR between 2015 and 2023. Among the different types of products available in the global market for optical brighteners are coumarin, stilbene, dicarboxylic acid, diphenyl pyrazoline, and cinnamic acid. Stilbene, among them, finds maximum application in optical brighteners. In 2014, it held more than 65% share in the market. On account of the easy and widespread availability of various derivatives and isomers of stilbene, it is predicted to maintain its leading position in the global optical brighteners market from 2015 to 2023. Cis and Trns isomers of stilbene are mainly used for producing numerous commercially used optical brighteners. Further, derivatives of stilbene, namely biphenyl-stilbenes and triazine-stilbenes also find application as commercial grade optical brighteners in different end-use segments. 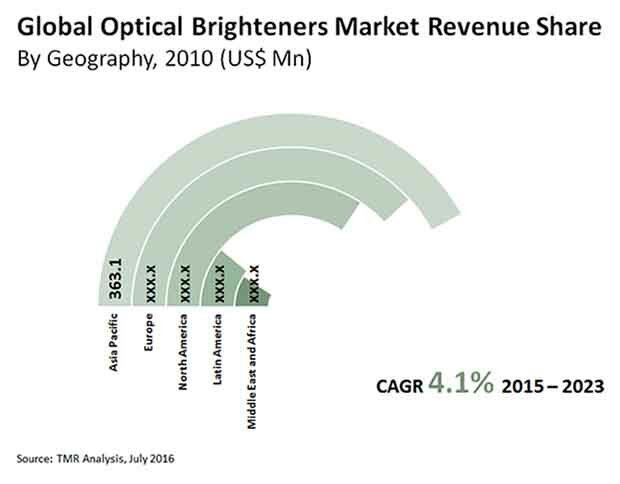 From a geographical standpoint, Asia Pacific leads the global market for optical brighteners. In 2014, the region held a share of 38% in the market. The growth in the region has been mainly driven by the rising production of raw materials and the growth in end-use industries, including paper, detergent, plastics, and ceramics. The region is expected to retain its sway over the global optical brighteners market in the next couple of years too by clocking healthy growth. Majorly contributing to the global optical brighteners market is the textile industry. “In the past few years, the flourishing growth achieved by the textile industry, especially across emerging economies such as India and China, has greatly influenced the total global demand for optical brighteners. This is slated to result in rising consumption of optical brighteners in the Asia Pacific market,” explains the analyst of the report. Another prominent growth driver in the global market for optical brighteners is the rapidly proliferating cosmetic industry. “Rising disposable incomes and a vast surge in the global demand for skincare and suncare products have encouraged the growth of the global cosmetics market in the past few years. Being another prominent consumer of optical brighteners, the growth of the cosmetics industry has in turn also boosted the overall global intake of optical brighteners,” adds the TMR analyst.